And he accused the United States of planning an imminent invasions because, he claimed, two American military surveillance planes had illegally entered Venezuelan airspace last week. Washington conducts these tasks to support communications of armed groups in war zones or to prepare actions to disable electronic equipment of the government, the armed forces or the economy." Maduro has decreed a state of emergency, giving himself additional powers that will permit the use of violence and arrests against opposition protests. "We, Venezuelans, will not accept this decree. This is Maduro putting himself above the constitution. To impose this, he'd better start preparing to deploy the war tanks and military jets. And I tell the armed forces: The hour of truth is coming, to decide whether you are with the constitution or with Maduro." Every month, the Syria peace talks start up, then collapse a few days later. Then they would be restarted, and the cycle repeats. I've reported on several rounds of this just in the last few months. So it's not surprising that the latest round of peace talks has collapsed, but this time the impasse is a lot worse since they didn't even bother to schedule a new date for the peace talks to restart, as they've always done in the past. "We need to bear in mind that credible intra-Syrian talks will become credible when [...] there is a credible development on the cessation of hostilities and a credible improvement on the humanitarian side." In other words, there couldn't be any peace talks between the Syrian regime and the opposition as long as they were still shooting at each other. "The challenge that we face now is to transform these possibilities into the reality of an agreement at some point. And because of the gains that we've made in recent months, yet because of their fragility, and we acknowledge they're fragile, and increasingly threatened by irresponsible and dangerous actions taken by those who would rather have this effort fail, who want to create problems, cause rather than solutions, they see a different outcome, and there are frankly actors on both side." Syria's president Bashar al-Assad started this war in 2011 by starting to exterminate peaceful demonstrators, including women and children. If there were some kind of cease-fire agreement, he would violate it as soon as another peaceful demonstration started. Al-Assad has been carrying out an extermination campaign on Syrian Sunni civilians, and he's going to continue until either they're all dead or he's dead. The Syrian opposition won't agree to a cease-fire if al-Assad is going to keep dropping barrel bombs on their women and children, which he is certainly going to do. The jihadist groups, so-called Islamic State (IS or ISIS or ISIL or Daesh) and the al-Qaeda linked Jabhat al-Nusra (al-Nusra Front). In fact, the peace plans have actually worsened the hostilities, are not going to agree to any cease-fire until al-Assad is overthrown, and a caliphate can be declared. ISIS and al-Nusra are specifically excluded from the "peace talks." This fact alone makes them a farce. Russia and Iran don't care how many innocent women and children al-Assad slaughters, if they can control Syria. In fact, the leaders of these countries are as guilty of war crimes and crimes against humanity as al-Assad, since they supplying the weapons and troops to allow him to continue is war crimes. So it's not surprising that the International Syria Support Group (ISSG), which was meeting in Vienna and which comprises the United States, Russia, the UN, the Arab League, the European Union, and 16 countries, announced on Tuesday that they had, once again, failed to reach any agreement to bring peace to Syria. The whole thing is an international farce. People always criticize me when I call al-Assad a genocidal monster, but he's clearly comparable to Hitler, Pol Pot, Mao Zedong and Stalin from the last century. There is no mass weapon of destruction, nor any gruesome form of torture, that he won't use to satisfy his psychopathy. Al-Assad is the lynchpin and the engine behind the Syrian war. It would never have started without him, and would have ended quickly if he had let it, or if he hadn't been supported by Russia and Iran. Thanks to his policy of exterminating Sunni civilians, tens of thousands of young jihadists have come from around the world to Syria to fight him. This has resulted in the creation of ISIS, and it's resulted in millions of refugees flooding neighboring countries, including countries in Europe. I've written thousands of Generational Dynamics analyses since 2003, which is the year that the current generational Crisis era began, and although the types of behavior we're seeing were all predictable and were all predicted, it's incredible to see them being played out on the world stage. The world is changing rapidly, as we're seeing people, especially young people, support Socialism, racism, and xenophobia in country after country exactly like the 1930s. These young people have no knowledge of history and the massive disasters caused by the Socialism or racism or the Holocaust, and are not even fazed as we see Socialist Venezuela collapse right before our very eyes. "Thanks Hugo Chavez for showing that the poor matter and wealth can be shared. 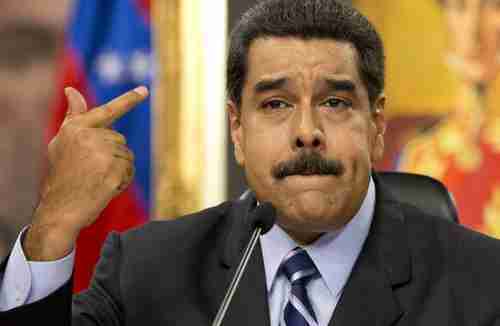 He made massive contributions to Venezuela & a very wide world"
The pathological stupidity of these people is amazing.